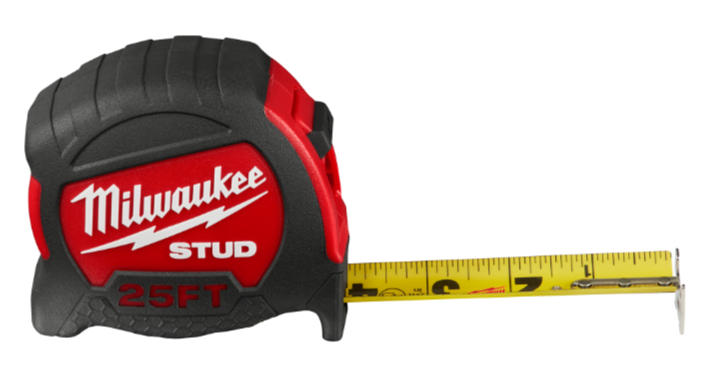 Milwaukee Tool says its new Stud tape measure is the most durable on the market, featuring a blade that is both rip- and wear- resistant. Miller says Stud was designed from the ground-up to solve the issue of tape tear. It’s also the first ever technology that protects the blade from ripping and wearing, the company says. “With this new technology, we have also increased the abrasion resistance by 10x of what we offer today so the numbers won’t wear out,” Miller adds. The tape features EXO360 Blade Technology to ensure resistance to ripping and wearing, the company says. It uses a protective nylon coating that wraps around the blade completely. Additionally, a fully reinforced frame and impact-resistant overmold allows the blade to survive an 80-foot drop (on packed soil). “For added functionality, Stud tape measures deliver up to 10 feet of straight standout and a patented finger stop mechanism,” the company says. “Finger Stop protects users’ fingers during blade retraction and maximizes stability during layout applications.” An improved wire form belt clip has been optimized for bag/belt storage and reducing pocket tearing, the company adds. The tape measures come in a 25- and a 16-foot version.